← Kiboko 22L+: The Best Photo Backpack Ever Made? 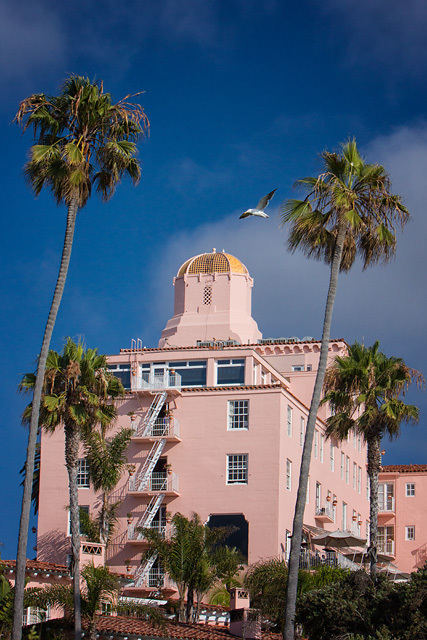 This is the famous La Valencia hotel in La Jolla. A tripod is perhaps often considered a hassle. You have to carry it around in addition to your camera(s) and lens(es), and you have to take the time to set it up before taking a shot. So, why bother? It caused me to slow down and visualize the image before deciding whether it was worth taking. It enabled me to carefully compose my image. It allowed me to wait patiently for the right moment (seagull in the right spot) while exactly preserving the composition and avoiding fatigued arms. How do you pick the right tripod? That’s a long story; I’ll save it for another post. However, almost any tripod is better than no tripod, so if you already have one, try using it more often. It will almost certainly help you shoot better photos. This entry was posted in Picture of the Week and tagged canon eos 60d, hotel, La Jolla, La Valencia, photography, tripod. Bookmark the permalink.